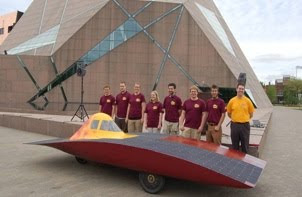 Today we recognize multiple Sustainos from the 2010 American Solar Challenge. This is a competition to design, build, and drive solar-powered cars in a cross-country rally event. Teams compete in a 1,100 mile drive from Broken Arrow, OK to Naperville, IL. The route was chosen to combine pieces of old routes used in previous events, giving a bit of an historical tribute for the 20 years of organized events in North America. The winner was University of Michigan's Infinium car. It was U of M's third straight national championship and sixth overall. The car crossed the line after six days on the road with an average speed of 40 mph. The second place winner was University Minnesota with their 400-pound beast of fiberglass composite. The next Challenge is set for October 2011. The competition, billed as the world's premier solar racing event, runs every two years.